The Ruhr area, which was shaped by coalmining and industry, is a melting pot of over 100 different nationalities where you can hear lots of different languages. English is one of them. Internationally operating companies often use English as their business language and there are thousands of adults who learn English in adult education centres and language schools. Recently the internet has also been used to communicate in English. FC Schalke 04 and Borussia Dortmund were the first football clubs to provide information in English on their websites. The mother tongue of football is also English as its origins are in England. However, so far there has not been any book in English which gives a comprehensive overview of the history of the Ruhr area, the development of its cities and its football clubs. 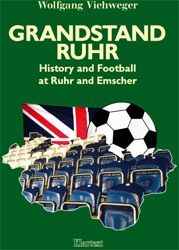 The forthcoming book Grandstand Ruhr fills this gap. - a picture book of the culture in the Ruhr area from the Middle Ages to the modern age. The book also provides a friendly welcome to foreign guests and proves that the Ruhr area is well prepared for them. When they arrive here in 2006 the book makes orientation easier and increases their pleasure while staying in the Ruhr area. Jürgen Halten has been teaching Business English at companies in the Ruhr area since 1996. He met his future wife Sue Goddard when they were working for the Financial Times in England. In 1996 they moved (back) to Wanne-Eickel and got married one year later. Sue, who studied French and German in Southampton, teaches English for primary school teachers and does courses for small children. But her main job is to look after two-year old daughter Lucy Jane who is brought up bilingually. Since March 2005 Jürgen has been working as a free-lance consultant for international communication. In 1999 he wrote the play "Standing at the docks in Southampton" and in 2004 the book "Mitten im English". Both works combine language information with British humour. When he does not teach Business English he plays with his daughter, works on his second book "Sprachlich fit für die WM 2006" and presents his "Fußballhauptstadt-Magazin" on Radio Herne 90.8 once a month.